WEB MD Article Supports Proper Toothbrushing Techniques And Points Out Common Mistakes! Americans consume huge amounts of soft drinks each year. Enough soft drinks are produced annually to provide 725 12-ounce servings (equivalent to more than 30 cases) to every man, woman, and child. Soft drinks, juices and sports drinks provide huge amounts of sugars to many diets. Each day, soda consumption alone provides the average teenage boy about 15 teaspoons of refined sugars, the average girl about 10 teaspoons. These amounts roughly equal the recommended daily limits for teens' sugar consumption from ALL foods. No matter what it's called-a soft drink, soda, or pop-drinking too much can cause tooth decay and harm your health. Sugars and acid in soft drinks, juices, sports drinks and energy drinks can set up the perfect environment for tooth decay. Drinking too much of these beverages can contribute to other health problems, such as, osteoporosis, kidney stones, and especially overweight and obesity, which are prime risk factors for type 2 diabetes in teens and adults. Soft drinks are a problem not only for what they contain, but for what the push out of the diet, including vitamins, minerals and fiber. Fewer than 50% of adolescent girls consume enough calcium daily, which can lead to early development of osteoporosis. Girls who drink carbonated beverages are 5 times more likely to have bone fractures than those who don't drink soda. Spoon out 10 level teaspoons of sugar ( in soda, it's called high fructose corn syrup) to see about how much is in a 12-ounce can of regular soda. Now spoon out 17 teaspoons for a 20-ounce bottle. Can you imagine eating that much sugar at one time! If you think diet soda is much better, think again. 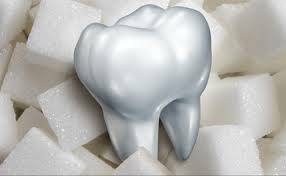 It may not have sugar but it still contains acid that can harm tooth enamel, which can lead to tooth decay. 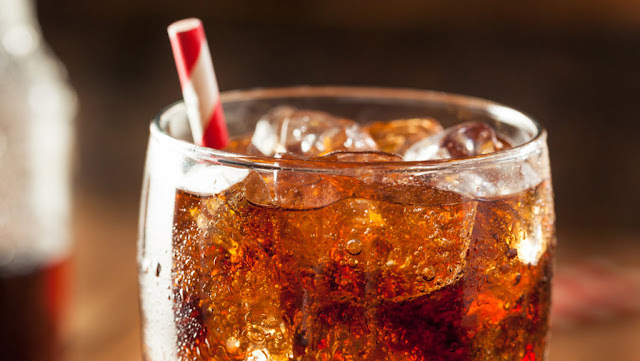 Soda and other soft drinks have refined sugar, such as high fructose corn syrup. Bacteria in the mouth process the sugar and produce acid. This acid, plus extra already present in the drink, demineralizes (softens) your tooth enamel, the outer coating of teeth that guards against tooth decay. 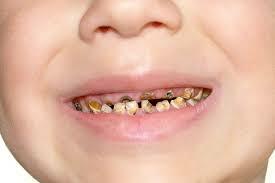 Tooth decay ( cavities) begin when enamel is weakened. Each acid attack lasts about 20 minutes, each sip you take resets the clock. Remember! Diet or "sugar free" drinks may not have sugar , but they contain harmful acid. Choose WATER; it's best for your hydration and health. Don't sip soda all day, drink a serving all at once. Consistent "sipping" exposes teeth to a prolonged acid attack. If you do drink soda, sports drinks, juices, or energy drinks, do so in moderation; not more than a 12-ounce serving (1 can) per day. And, it's best to drink it with a meal. 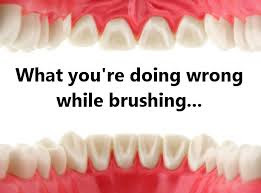 After having a soft drink, wait a half hour, then brush your teeth. If you can't brush, rinse your mouth with water to dilute the sugars and acid, or chew gum which contains xylitol, a sugar substitute shown to discourage tooth decay. Brush at least twice daily with fluoride toothpaste and floss daily to remove plaque buildup between teeth and along gums. Check the label for the pH. A normal mouth has a pH of 6.3 to 7, which is close to neutral. 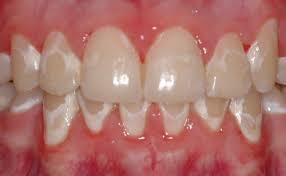 Tooth enamel begins to deminerilize (dissolve) at pH levels below 5.5. Sodas have an average pH of 2.5! money down the drain...In 2004, Americans spent $68 billion on carbonated drinks, and billions more on non-carbonated drinks...$850 per household... enough to buy a computer and a year's worth of Internet access. starting young...One fifth of 1 and 2 year old children consume soft drinks. Those toddlers drink an average of seven ounces, about 1 cup, each day. Almost half of all children between ages 6 and 11 drink soda, with the average child drinking 15 ounces a day. what's being learned at school...The alliance for a Healthier Generation has has worked with leading beverage companies to create guidelines which allow only lower calorie nutritious beverages to be sold at schools. Be a part of this important movement and a voice for our youth. Ask your school to offer healthier options like reduced-fat milk and water. And, make sure at home you practice what you preach. empty calories, excess weight...In 2004, the average American drank 37 gallons, 60,000 calories, of non-diet soft drinks; adding in another 16 gallons of fruit and sport drinks brings the total to about 85,000 calories. All those calories can contribute to excessive weight gain and related health problems. sizes are growing...In the 1950's, a bottle of soda was 6.5 ounces. Today, a 12-ounce can is standard and a 20-ounce bottle is common. Larger container sizes mean more calories, more sugar and more acid from a single container of soda. caffeine in a can...The amounts of caffeine in one or two cans of caffeinated soft drinks can affect performance and mood, increase anxiety in children and reduce the ability to sleep. better keep exercising...To burn off the calories in a 20-ounce bottle of non-diet soda, a 135-pound person would have to walk three moles in 45 minutes, play vigorous basketball for 40 minutes or bike vigorously for 22 minutes. Although the most common forms of cancer are prostate, lung, skin, and breast, there are over 100 types — some which are more severe than others. Of these, mouth cancer isn’t as widely discussed. In terms of risk factors, tobacco significantly increases one’s risk, accounting for approximately two-thirds of all mouth cancer cases. There are both early and late warning signs, so any abnormal symptoms should be viewed by a medical professional. When caught early, oral cancer is one of the most preventable. Once advanced, it’s much harder to treat, taking the lives of over 9,500 Americans each year. The following 7 signs may indicate mouth cancer is developing. When suffering from mouth cancer, individuals often experience painful sores, known as ulcers. With that being said, broken areas of skin are not always painful, even if they are caused by cancer. They are generally yellow or red in color, appearing without any obvious cause, such as a sharp tooth which needs to be addressed. If a mouth ulcer does not heal after three weeks, it needs to be examined by a physician. In many cases, a lesion is diagnosed as being precancerous. This means that although cells are abnormal, they are confined to the mouth lining. Once these cells develop below the mucosal lining, a malignancy can then progress into oral cancer. 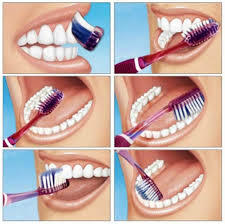 A number of studies have concluded periodontal disease increases one’s risk of oral cancer. Loose teeth may also be its own independent risk factor, as oral cancer causes chronic trauma to the oral mucosa. When biting down, some patients notice their teeth do not fit together as they once did. This can be due to a tumor on the jawbone, causing teeth to shift. When areas of cells are abnormal, they can appear to be white or red. The white patches are known as leukoplakia, whereas the red patches are known as erythroplakia. Although these patches are not necessarily cancer, if left untreated, they can develop into mouth cancer. Since they can be precancerous, catching them early could prevent the spread of abnormal, cancerous cells. Only about 5 percent of those with white patches develop cancer, whereas approximately 50 percent of red patches become cancerous. In order to test these patches, doctors take a sample of the affected area — better known as a biopsy. In many cases, a fungal infection is to blame, which can be treated. If a lump develops in your neck, this could indicate an enlarged lymph node. This is a common warning sign in both mouth and oropharyngeal cancers. If the lump is red, hot, or painful, it could mean an infection has developed and is probably not cancerous. The same is true for lumps which come and go. When a lump is cancerous, it generally forms and grows slowly. Some also experience a lump on their lip, in their mouth, or throat. Normally gums are smooth, but in the case of mouth cancer, they become almost sandy in texture. More commonly a firm, rough mass will develop. Some notice that their skin becomes thicker, while others experience swelling in their lymph glands. As inflammation increases, the ability to swallow can become more challenging. 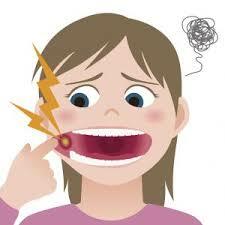 Nerves that provide feeling to the tongue and lower lip can be affected, causing changes in feeling. Some experience numbness, while other notice tingling — almost like pins and needles. For those that suffer from diabetic nerve damage, it is similar to those sensations, but instead, is felt within the mouth. When nerve damage occurs, earaches may also develop due to the fibers that connect the tongue to the ear. Obviously bad breath alone does not indicate cancer, however, persistent bad breath may indicate an early warning sign of cancerous cells. Bad breath may be a sign of oral, stomach, esophageal, pulmonary, or pharyngeal cancer. In many cases, this is due to decay. Of course, if you’re a smoker, this can also contribute to bad breath. Through a combination of dry mouth, bacteria, and the tobacco itself, bad breath develops. Since oral health is generally a good indication of overall health, seek a full dental exam if you’re worried about problematic symptoms. tactile palpation: your dentist will palpate the tissues/glands of the head and neck to asses for any irregularities. cancer screening lights: your dentist may use a special light that can illuminate cancer cells beneath the tissues surface before they are visible in the oral cavity. toludine blue: your dentist may use a special dye to determine is an oral lesion needs to be biopsied. The dye sticks to areas of dysplasia, thus indicating areas where the cells are changing and possibly becoming malignant.